We spend the day exploring Addis Ababa beginning with a visit to the National Museum, one of the most important sub- Saharan museums in all of Africa. The museum is home to the fossilized humanoid Lucy, as well as an amazing collection of artifacts, royal items and art. We then visit the Ethnological Museum, which was the former palace of Haile Selassie. The business center of Addis Ababa. After lunch, we take time in St. George Cathedral, built in 1896 by Emperor Menelik and then continue on to Holy Trinity Cathedral. Holy Trinity Cathedral is the largest Orthodox Church in Ethiopia and has survived through many historical periods, as its interesting architecture can attest to. The Cathedral contains the thrones and the tombs of the emperor and some of the royal family. The Blue Nile, we take a short flight this morning north to Bahir Dar. 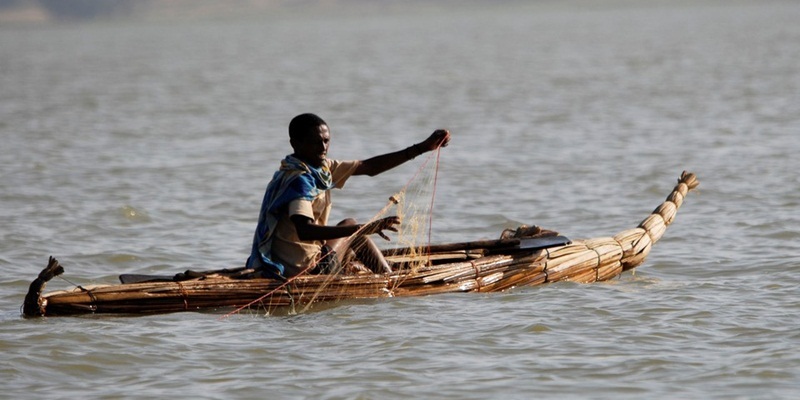 Bahir Dar is a pleasant city located on the shores of Lake Tana, the largest lake in Ethiopia. 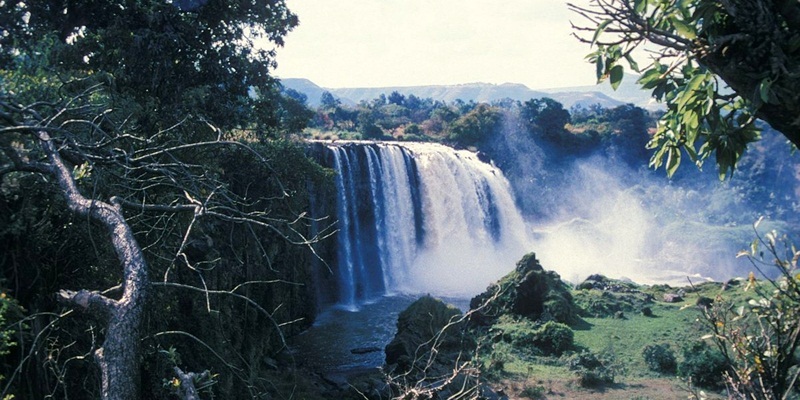 After checking into our hotel, we drive to the Blue Nile Falls, which is known locally as Tissisat (smoking water) Falls: 100 m (328 ft) wide, the water plunges for 45 m (148 ft), giving rise to steam clouds and rainbows. We climb down to the base of the falls for an up-close look and then ascend the other side. We cross the Blue Nile by boat to return to the point of departure. 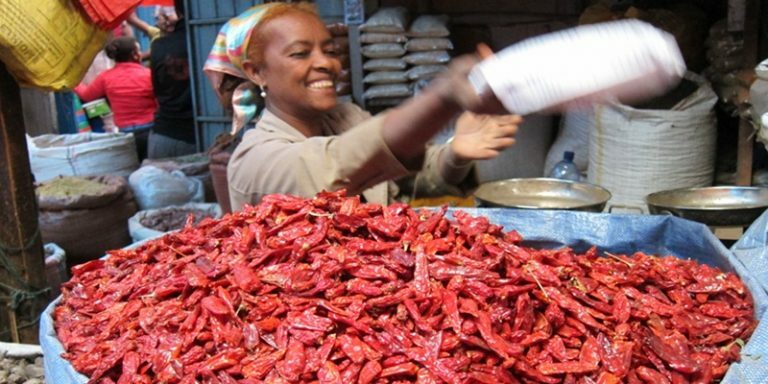 After lunch we explore the city of Bahir Dar, including the market and the Bezawit Palace (formerly the Palace of Haile Selassie). A short drive from our hotel, we visit a Woyito Village, where we will see the production of the papyrus boats known as tankwas. We spend the day exploring Lake Tana and its islands by boat. 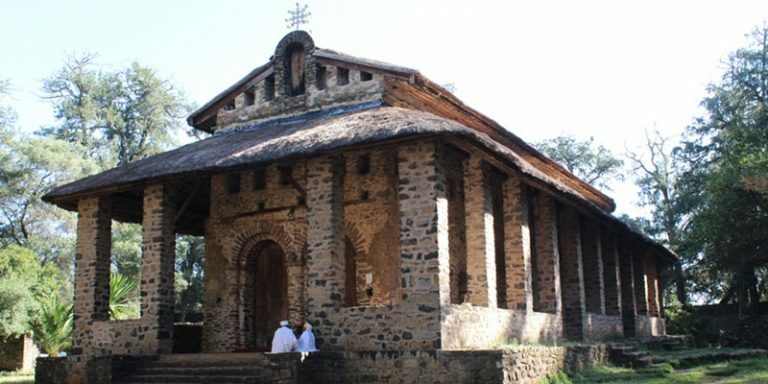 There are 37 islands on Lake Tana and 30 of them have churches and monasteries of considerable historical and cultural interest. 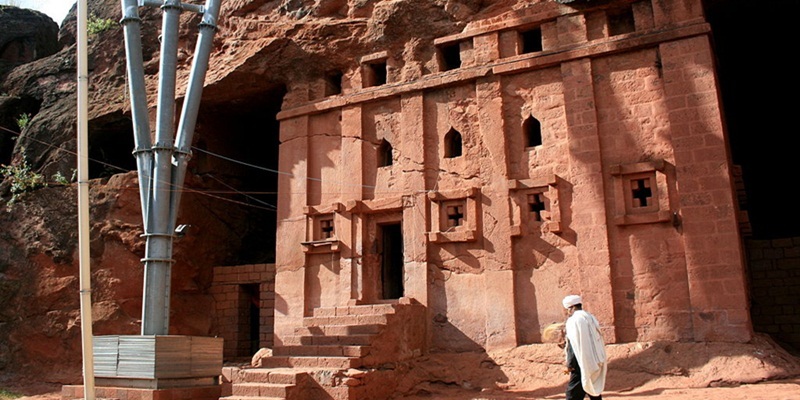 We visit the monastery churches of Ura Kidane Mihiret and Azoa Mariam. Upon arrival into Gorgora village, we visit Debere Sina Church before continuing by road to Gondar. 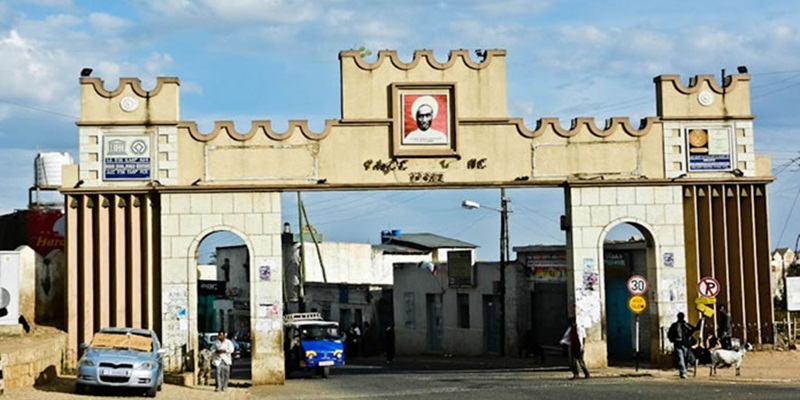 Gondar was the first capital city of the Ethiopian Empire, which began in 1632 with the reign of Fasilidas. In Gondar, there are a dozen castles built by various emperors over the course of 236 years. The city seems more European than African and also has Islamic influences. In the afternoon, we visit Fasilidas’ Palace, probably the most impressive of all the castles found in the area and the oldest one! We continue on to Quskuam Church and the Church Of Debre Berhan Selassie (Light of the Trinity). 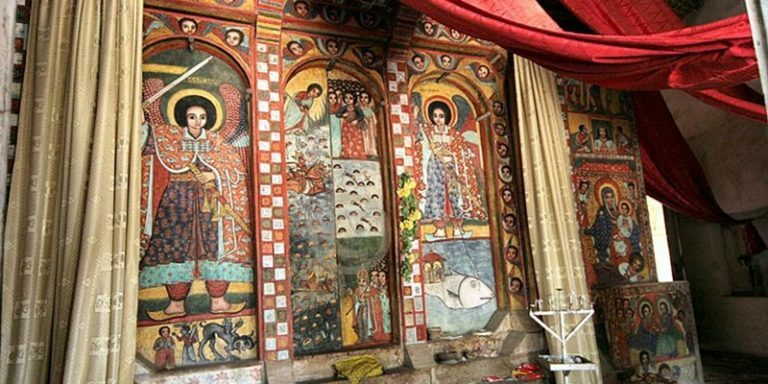 The interior of Debre Berham Selassie is decorated with beautiful frescos, cherubs and paintings. 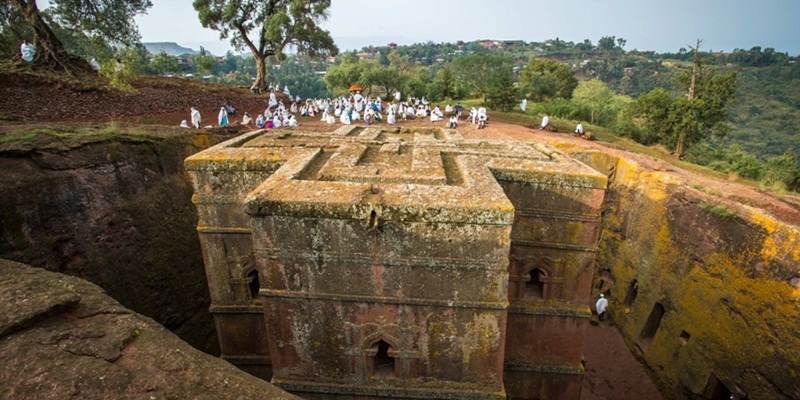 Debre Berhan Selassie is rumored to once have been the proposed final resting-place of the Ark of the Covenant. We head off today for a full day in the Simien Mountains (Simien National Park is a UNESCO World Heritage Site). The road passes over mountainous areas of wild beauty, drawing close to the Simien Massif (in Amharic, Simien means north). In the park, many of the mountain peaks exceed 4,000 m (13123 ft); the highest is Ras Dejen, at 4,543 m (1905 ft) above sea level. These mountains consist of volcanic masses that have been eroded away by centuries of rain. Today they have amethyst-colored peaks and deep gullies, which have been further deepened by rivers. The crevices play host to the Walya, the ibex of the Simien Mountains. We have a two-hour hike and a picnic lunch before returning to Gondar. On the return trip, we visit the village of the Felasha, famous for their ceramics. We arrive back in Gondar early evening. A short flight takes us from Gondar to Lalibela. The city contains 11 monolithic churches that were built in the 12th century and are carved out of the pink granite rock; they have been classified as a UNESCO World Heritage Site. Each church (Bet) has a unique architectural style; all are superbly carved and most of them are decorated with well-preserved paintings. The entire city may be described as a sculpture dedicated to the glory of God. The day is dedicated to visiting the first group of churches, known as the Northern Group of Churches. The last church we visit today is Bet Giyorgis, one of the more recent churches and best preserved. We return to our hotel and should time allow, we will have a walk around the city center. In the morning visit The Eastern Rock Churches. This afternoon, we visit the Nakutelab Rock Hewn Church, built under a natural cave. Tonight, we have a special treat, participating in The Coffee Ceremony, a ceremony of hospitality in Ethiopia. We fly today to Axum – a UNESCO World Heritage Site. The legends narrated in the Kebre Nagast (Book of Kings) recount how the city of Axum as early as the 10 th century B.C was already the city in which the Queen of Sheba resided. Famous long before the time of Christ, Axum was the capital of the long Axumite reign, one of the oldest African empires and represented a crucial connecting-point between Africa and Asia for almost a thousand years. We visit the stelae: granite monoliths dating from pre-Christian times and decorated with symbolic engravings. In ancient times, there were seven stelae, now one of them is in Rome – Mussolini took it there during Italy’s invasion of Ethiopia. There is also a visit to the church of Saint Mary of Zion. A chapel in the church is believed by many to contain The Ark of the Covenant. “The Guardian” who is the only person who is allowed into the chapel and the only person who may set eyes on it guards it. There is also a small museum here, which contains the crowns of Ethiopian kings and other treasures. Axum to Addis Ababa we fly back to Addis Ababa this morning. After lunch, we enjoy a free afternoon; you may want to visit one of the many museums or the interesting Mercato.